So we packed back up and headed to Tennessee. Packing up and heading to Tennessee is not as easy as it used to be. My wife Abby and I have two sons, Brandon (3 years old) and Jordan (6 months old). Boy do those two little squirts take up a lot of room! Also making the trip even crazier is that Cleveland, Tennessee is 9 hours from our home in Indiana! This would be the farthest we have ever driven with both boys. Packing up and driving 9 hours for a Pickleball tournament! My grandma always says, “You guys must have Pickleballs in your brain!” Is that a bad thing? We left Thursday night and made a quick pit stop in Lexington to catch a couple hours of sleep. Thank you to one of my old USTA tennis buddies, Casey Hutchings and his wife, for giving us a place to stay. Friday morning we woke up bright and early and headed to the tournament site at Lee University. When we arrived, Rocket and GG (Grandma Grubbs) were already at the courts. We unpacked and warmed up a little before the tourney started. Friday was all singles. This was the first year for this tournament so there weren’t a ton of players in each division. The Grubbs clan came out of Friday with three gold medals! Rocket won his age division, Abby won the women’s division, and I won my age division. A great start to the tourney! Saturday was a full day of mixed doubles. Abby and I were the only ones playing on this day from the Grubbs family. 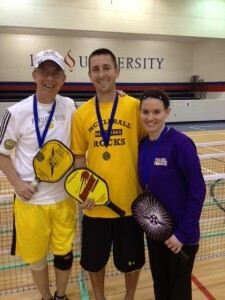 Rocket made a 5 hour drive up to Louisville, Kentucky to hold a beginners Pickleball clinic with my brother Zack and his wife Amy. They had about 25 new Pickleball players come out and learn about this great game. Abby and I started off a little sluggish losing our first round match. Then, we rebounded to win the losers bracket and get another chance at the team that put us into the losers bracket. We played really well and beat them in 2 games, which meant we had to play them one final game to 15. WINNER TAKES ALL! We came out a little flat (NO, ACTUALLY WE CAME OUT A LOT FLAT) and got down 0-8. Not exactly the start we were looking for. We switched sides. And then that is when Abby took over. It was the best I have ever seen her play! We went on to win the match 15-8! I don’t think Abby drove all that way with the kids for a silver medal! A great finish to the second day of the tourney. 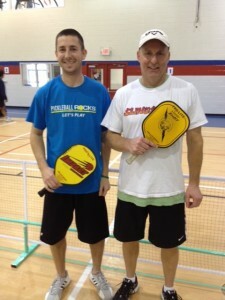 On Sunday, the last and final day of the tournament, Rocket and Steve Dunn took the courts and brought home a gold medal! I had the opportunity to play with Jimmie Williamson from Georgia. We literally met five minutes before the tournament started that day. We went over a couple things and headed out to the courts. It’s always fun meeting new people and playing with someone new at these tournaments. Jimmie and I played so well together that we ended up taking the gold against some really good players from Nashville. And just FYI, the hospitality room made a great camp for the two boys and GG to hang out. Plus it was fully stocked with fresh apples, oranges and bowls full of Kristin Beasley’s homemade Almond Granola. 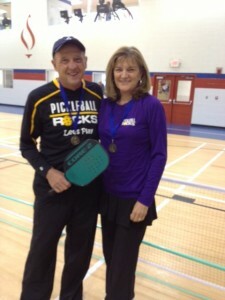 We have met so many great people through the wonderful sport of Pickleball. Both Abby and I played college sports and Pickleball gives us the opportunity to still be active and competitive, something we both enjoy! This also allows us to make many family memories and watch the boys grow up around the Pickleball courts. Our son Brandon couldn’t fall asleep Saturday night because he kept saying, “I want to go to the Pickleball Tournament.” We explained to him that we were going back in the morning and he was excited! and most of all, more memories as a family.